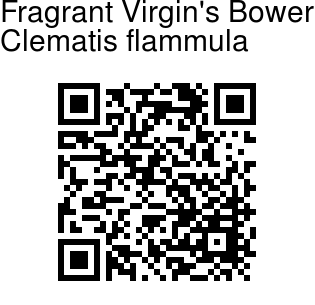 Fragrant Virgin's Vower is a climber native to southern Europe and northern Africa, but it is cultivated worldwide as an ornamental plant in gardens. Oppositely arranged leaves are double-compound, falling in autumn. Leaflets are thick, sparsely hairy, entire (rarely 2-lobed). 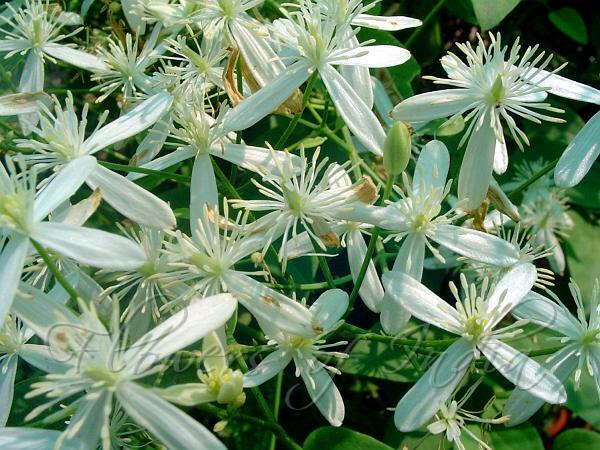 This woody vine bears fragrant white flowers, 2-3 cm across, and small green achenes. When the flowers are newly opened they have a strong sweet almond fragrance. The vine grows in a tangled mass that is heavily sprinkled with flowers throughout the warmer months. It is popular with gardeners as a decoration along fences and trellises, or as ground cover. If the vine has no other plants or structures to climb on, it will climb on itself, forming a large, densely tangled bush. The plant sends out many shoots and can reach over five meters in height. It is sweet-smelling but poisonous.